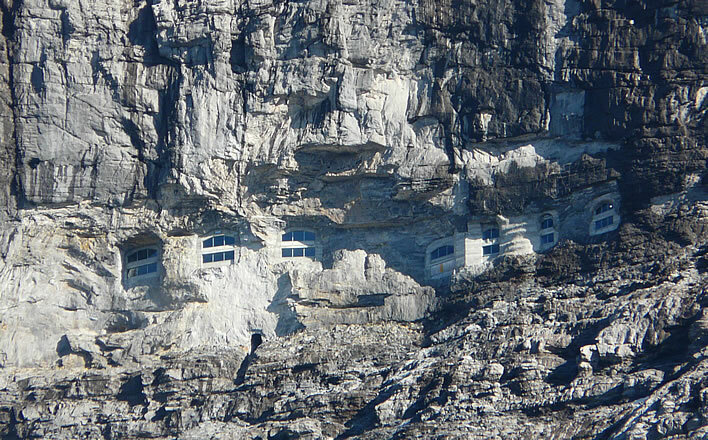 The renowned North Face of the Eiger in Switzerland. The tunnel of the Jungfrau Railway runs behind the face on its way between Kleine Scheidegg and the Jungfraujoch station. 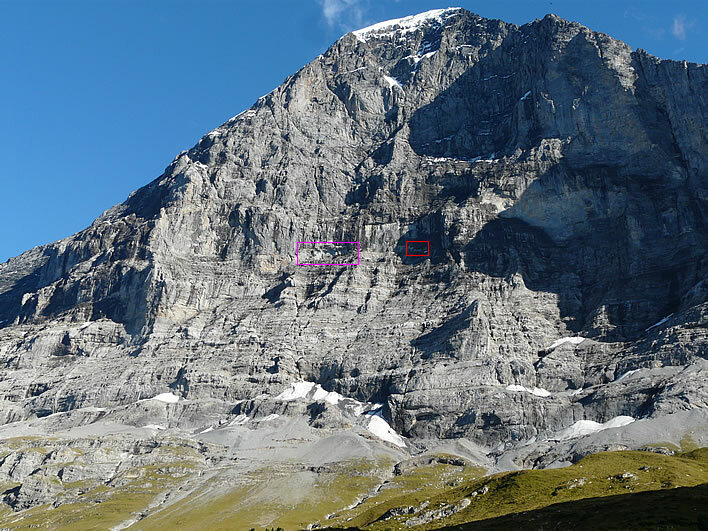 The red rectangle marks the Stollenloch, the 'tunnel hole' that was cut during the building of the Jungfrau Railway in 1903. The spoil from the building of the railway tunnel from here onwards was tipped out of this hole. 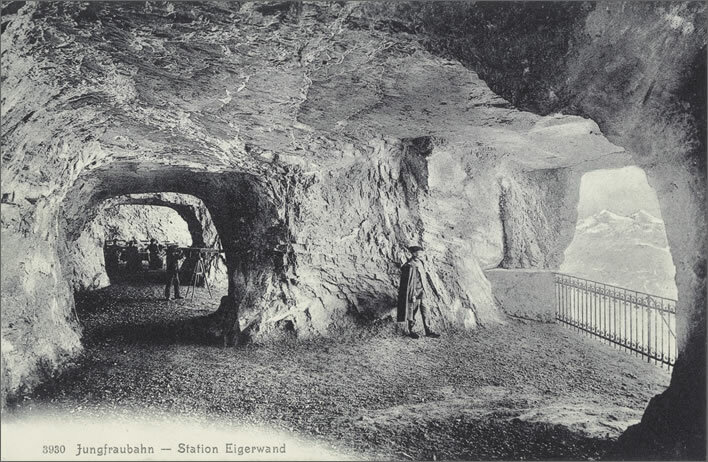 After the railway was completed in 1912 the hole played an important part in the history of climbing on the North Face of the Eiger. 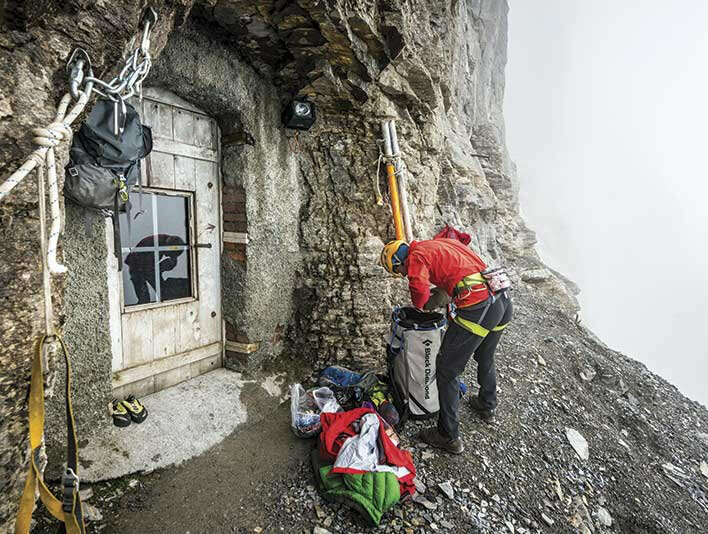 In May 2013 the noted Swiss alpinist Dani Arnold took the NZZ blogger Natascha Knecht for a brief tour of a section of the North Face starting out from the Stollenloch. Climbers need explicit permission from the Jungfrau railway to stop the train at the tunnel hole. Top: Dani Arnold digging free the door of the hole. The inside of the tunnel is completely dark, of course– the light in this image comes from the flash on Natascha's camera. 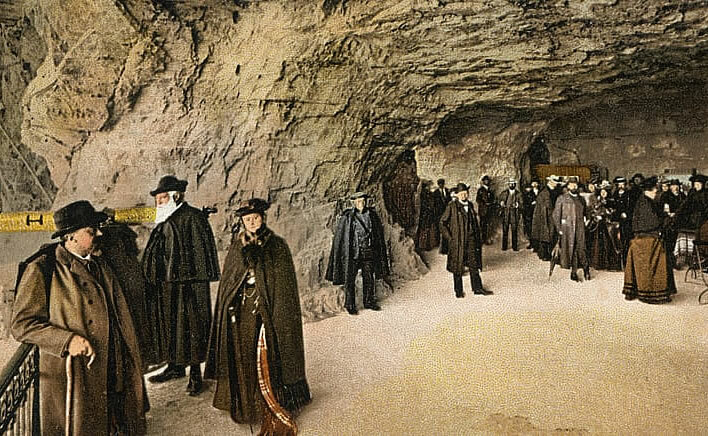 The rock chamber here is only a few metres from the railway line. 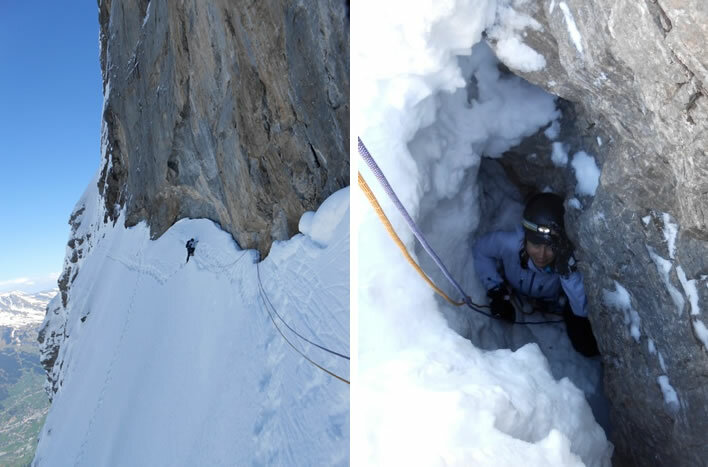 Bottom left: At the end of the tour – Natascha returning to the Stollenloch across the Hinterstoisser Traverse. This image gives a good idea of the scale of the north wall. 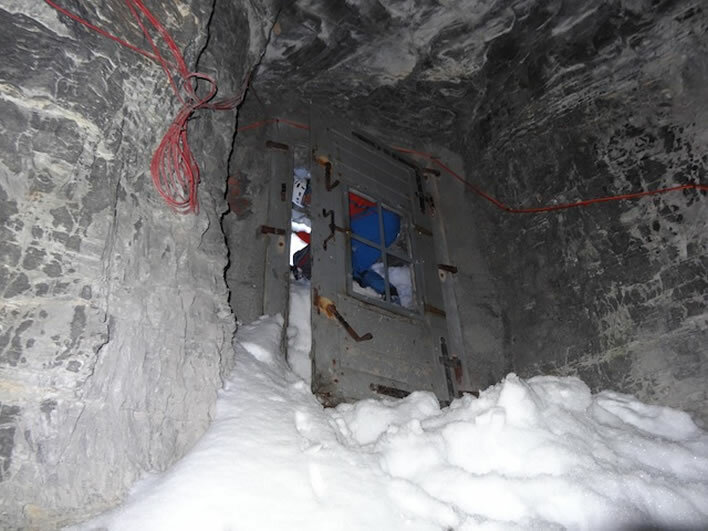 Bottom right: Re-entering the Stollenloch through the hole in the snow that they dug to get out. She looks pleased to be back. Image: ©Natascha Knecht. The exterior of the Stollenloch at snow-free times. Image: @alkanomega. All this talk of the door of the Stollenloch– the portal between the confining darkness of the inner mountain and the endlessness of the space outside – may remind some readers of our meditation on doors in the Quote and image of the month 09.2016. Instead of the painting of the entrance to an inn by Martinus Rørbye we could just as well have used an image of the Stollenloch in the Eiger North Face. 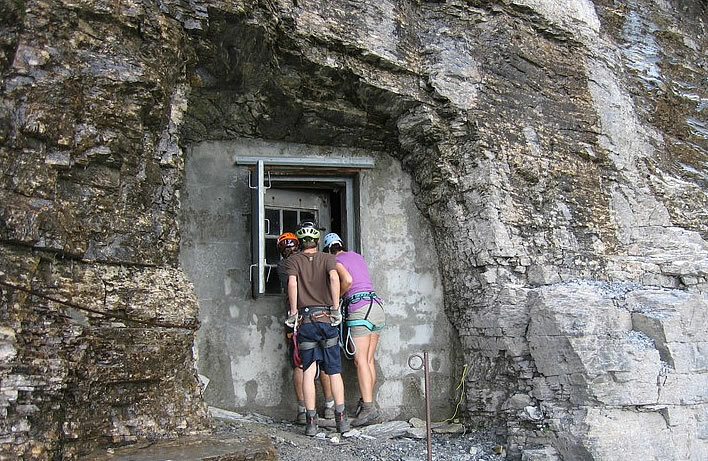 Investigating the Stollenloch on the former Rotstock Station from the Via Ferrata. Image: visinand.ch. The purple rectangle marks the windows of the Eigerwand	Station of the Jungfrau Railway at 2865 m. This used to be a pleasant stop on the journey up to the Jungfraujoch, but since 11 December 2016 trains no longer stop here, lopping 17 minutes off the journey time – 34 minutes more you have available to spend money in the restaurant at the top. One more contribution to the decline of civilisation in the West in the modern obsession with haste. 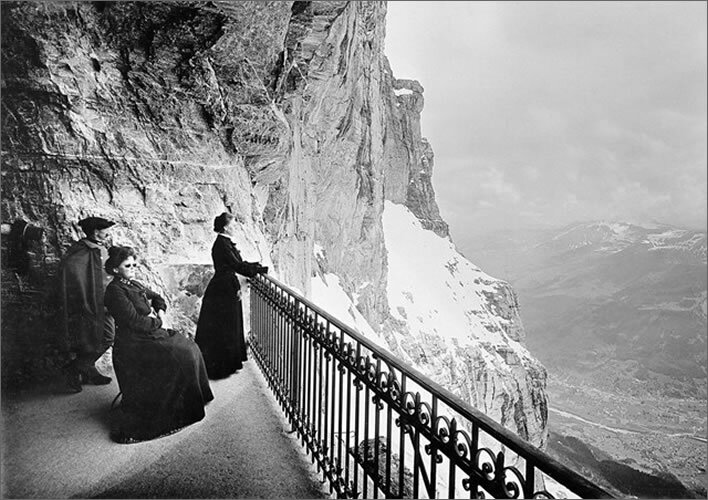 More civilised times at the Eigerwand Station before it was glazed in (in the 1970s) so that travellers would not have to experience the weather. Pity really: standing in the middle of an alpine thunderstorm with hail and horizontal lightning would have been quite something. The station was given up entirely in 2016.